Since 1907 we’ve been helping home owners and decorators with their painting projects. Many things have changed since our first store opened its doors. For instance, nobody uses lead in their paint products anymore. With paints by Benjamin Moore Chicago can rest assured about that. House construction, wall materials, and of course the ever exciting and changing world of interior decor have all undergone sweeping shifts in science and style. What can we do for you today? How about a primer on wall prep before painting with your new favorite color? Remove furniture, switch plate covers, decorations, outlet covers, etc. If you can’t remove it, move it to the center of the room (and cover it) where it can be stored until the project is finished. Clean the entire room thoroughly to remove dust, grease build up, cobwebs, peeling paint, etc. You don’t want any of this getting under your new paint. Line the walls along the floor with paper, plastic, canvas, or anything that will stay in place and protect your floors. Spackle and sand any dents, dings, or nail holes that are in the walls. Once you know your walls are clean and dry, apply primer as a protective undercoat. This is not a necessary step for some rooms, but it can be very important in bathrooms and kitchens. Apply tape around woodwork, electrical areas, windows, doorknobs, and any other place you don’t want to get paint on. Cut in about an inch from ceiling and baseboards and apply a thin layer of paint that will help cover the old paint. This protects your finished project in case you peel off the tape and see some unevenness. Double check your cleaning, where furniture items have been moved to, and how secure your tape and covers are. Load your playlist of the tunes you want to paint to! We can’t emphasize enough how important it is to have the right tools. From painters cloth to paint, you need supplies you can count on to simplify your project and assure long lasting and beautiful results. We supply all of this with pride. For paints and supplies by Benjamin Moore Chicago decorators rely on JC Licht. We are professional, experienced, and always up-to-date. We can answer your questions and help you stay on budget while you undertake any painting project. Before you even begin, call us or come in for a visit. 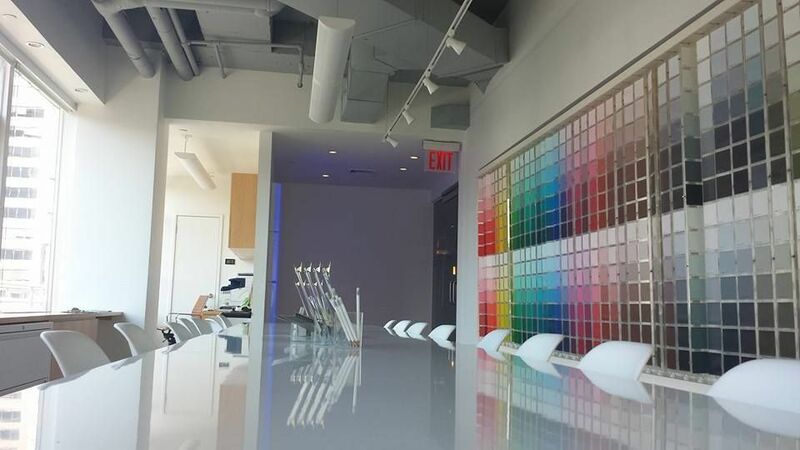 Get the information you need and see the glorious colors we have available in Benjamin Moore paints that Chicagoland loves.The first step towards success is careful preparation. Come in today.